Just in time before kids break for the summer, our friend, Jamie from Hands On As We Grow, is offering a guided independent play challenge. We’d like to extend an invitation for YOU to join us. The FREE 5-Day Independent Play Challenge is an awesome way to get resources for creative, yet independent, play with personalized support for encouraging your own kids at home, in childcare, or in the classroom. Every parent, childcare provider, or teacher has times when we NEED a few minutes of quiet to ourselves. We have jobs to do, laundry, documentation, paperwork, or we just need a few moments to observe, re-group, or re-focus our own energies. We hope YOU can join us in the challenge to help your own students (or kids at home) grow and learn through creative and independent PLAY. JOIN us to help your kids play independently – the challenge BEGINS April 22! 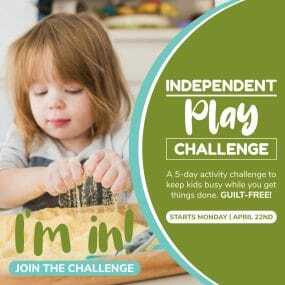 The live, guided Independent Play Challenge begins on April 22, 2019. You’ll want to sign up early for bonus resources and the supply list so you are ready to begin on the 22nd. JOIN THE 5-Day Independent Play CHALLENGE HERE! Need a few moments to yourself? Come JOIN US for the FREE 5-Day Independent Play Challenge from Hands On As We Grow! Gain simple “go-to activities” that keep your child creative and busy while playing independently. Develop strategies, through play, to keep your child entertained long enough for YOU to regroup or finish important tasks. Learn how to design FUN, yet independent, activities with simple supplies you most likely already have at home or in the classroom (a supply list will be provided to make sure you are ready). Free yourself from the GUILT associated with taking a few minutes to yourself. Not only will your students and kids love the activities in the challenge, but YOU (and your kids) will have a better attitude with REAL support for independent play. To keep everyone registered on track, there is a special community on Facebook to share, ask questions, and learn from others in the challenge. The challenge is totally FREE to join and so much FUN! Once registered for the challenge, you’ll receive a materials list and a personal invite from Jamie to join the Facebook challenge group. We hope YOU can join us! 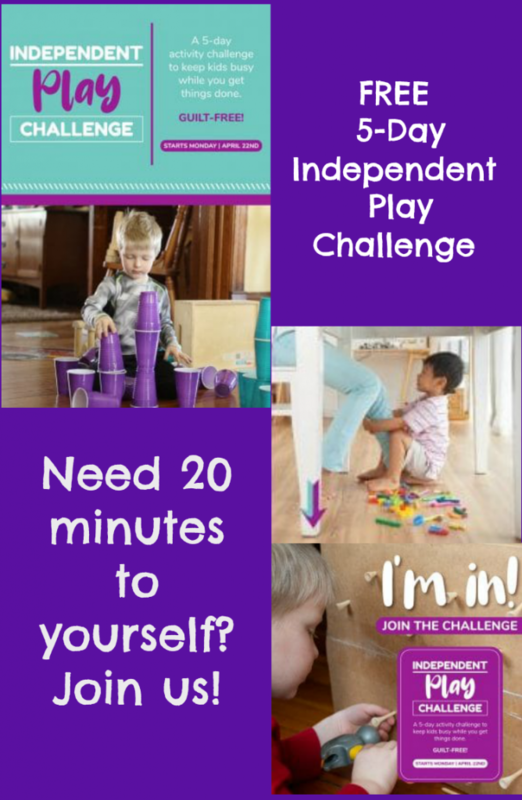 You can REGISTER for the Free 5-Day Independent Play Challenge HERE. Come learn how to help your kids grow through independent and creative PLAY!